Next Meeting on 19th Oct.
Next October meeting will be held in lunchtime, starting one hour earlier than usual.The Venue will be a restaurant near Iidabashi Station. 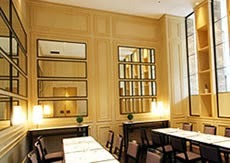 Venue: Hotel Metropolitan Edmond 1st Floor Restaurant 'Bel Tempo' private room. *We have to adjusted the meeting schedule one hour earlier than usual 12:00-14:00. (normally 13:00-15:00). *Since lunch buffet will be served during this meeting, 3,000 yen will be charged per person.. Enjoying buffet lunch, we will have a session as usual with speeches, table topics and so on. Why not join us and learn English speaking and presentatio in a relaxing atmosphere? We hope both Toastmasters and non-Toastmasters come and join us.